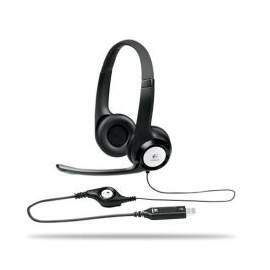 ClearChat Comfort USB -- Extend your comfort with a padded headband and ear pads. A rotating, noise-canceling microphone reduces background chatter, and convenient in-line volume and mute controls let you adjust audio on the fly. -- Adjustable, padded headband and plush ear pads: Ensure a comfortable fit. -- Noise-canceling microphone: Reduces background noise for clear conversation and voice commands. Microphone rotates out of the way when you`re listening to music or watching a movie. - In-line volume and mute controls: Instantly adjust headset volume or mute the microphone. - Advanced digital USB: Experience superior sound clarity with the simplicity of a single USB plug-and-play connection.